The MG Midget developed from the Austin Healey Sprite MK I launched in May 1958, with the MG Midget MK1 launched in June 1961. 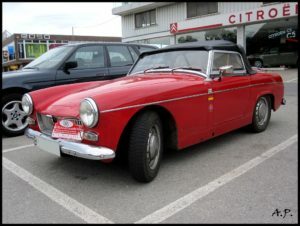 The only difference between the MG Midget and its stable mate the MK2 Sprite are its MG badges, additional chrome trim strips, slatted chrome grill and slightly better interior. Your first consideration when you are buying an MG Midget is the state of the body-work. The size of the MG Midget makes any restoration a hard task due to the tight dimensions. The easily available repair panels at reasonable prices make restorations for the professional and amateur alike a boon, however with this in mind check any potential purchase carefully. Make sure you check all areas of the car, ensure all panels line up, that gaps between panels are even, no dents or ripples or any creases in the body-work. Look out for any panels or areas of the body-work that have different shades of paint they maybe covering repairs made with filler. A soft top in less than average condition should be noted and the condition of the floor checked for corrosion. The front valance is often the first casualty in even a minor accident along with stone damage and it is important to check the seam where the front wing joins the apron. Check behind the bumper mounting for signs of accident damage and also check the condition of the bumpers, especially rubber bumpers as they are costly to replace. The front wings have a tendency to rust along the lower seam where the wing meets the top of the sill panel. The area around the headlamp attracts corrosion and there is also a drain hole at the bottom of the lip on the front wings and if blocked dirt and sludge builds and rots the panel. Make sure that the doors have even gaps all round and are fitted correctly. A tight fitting door that sticks at the top could be the sign of a folding body tub or a tub that has been repaired without support. Check that the door seals are in good order and ensure the window winders are working, it’s especially important to check the drain holes in the door bottoms are clear and look for rust along the door bottoms. Check the A post area very carefully for any rust here, any problem here is difficult to repair. The sills are the most common area for rust and the only repair is replacement of the panel. To examine a sill lay down along the side of the car and shine a torch along the underside checking for corrosion holes, drainage holes maybe present but not always. Surface rust on a sill may hide severe damage underneath. Repair sections are available for the bonnet but some skill is needed to fit, any dents in the bonnet are also difficult to repair and you would probably be better off buying a complete panel. The top of the wheel arch inner and outer panels can corrode; the square wheel arch models seem particularly prone to this. The lower rear wing immediately behind the door where it joins the sill is another area liable to rust. Check these areas and rear quarter wing for corrosion or body filler. Open the boot and examine the spare wheel area for signs of dampness or rust, check the spare wheel and jack are present too. Before closing again check the lip of the boot lid for signs of corrosion. Thoroughly check this area by lifting the carpets and checking the floor underneath, the area behind the seats is prone to the buildup of road dirt and salt. Finally, when buying an MG Midget the last area for review is the engine bay. Check the engine for oil leaks in particular around the filter housing and gaskets. Any trace of anti-freeze or rust stains on the engine block could indicate water leaks. Listen to the engine running, check for blowing around manifolds and between the manifold and down pipe. Examine the clutch and brake master cylinder and surrounding paint-work for signs of fluid leaks or spillage. The battery can be found at the back of the engine bay and it should be correctly secured as any spillage from the battery can lead to corrosion of the surrounding body-work.